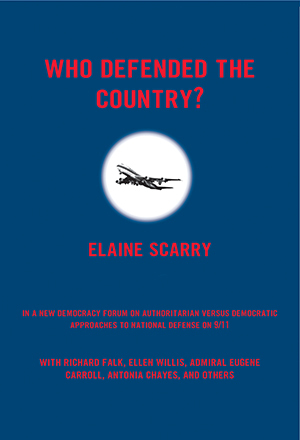 Beacon Press: Who Defended The Country? Through a minute-by-minute analysis of the phone calls, official reports, responses, and reported actions of passengers on two hijacked flights, United Airlines 93 (which crashed in Pennsylvania) and American Airlines 77 (which crashed into the Pentagon), Elaine Scarry offers a dramatic retelling of their fate and some startling conclusions. Leading off a provocative debate, she asks if the difficulty we had as a country in defending ourselves on September 11 suggests serious flaws in our national security. The need to act in’a matter of minutes’ has been invoked to justify military arrangements increasingly outside the citizenry’s control, yet the only successful defense on September 11 was carried out, after a vote, by the passengers themselves on hijacked Flight 93. Arguments made at the time of the writing of the Constitution judged that the only plausible way to defend the home ground was to have actions measured against the norms of civilian life: the military had to be’held within a civil frame.’ Scarry asks, have we strayed too far from this model? Does our authoritarian conception of national defense diminish our capacity to protect ourselves? Is it legal? Is it moral? Responding to her argument are nine prominent thinkers and writers from across the political spectrum, including Richard Falk, Ellen Willis, Admiral Eugene Carroll, and Antonia Chayes.